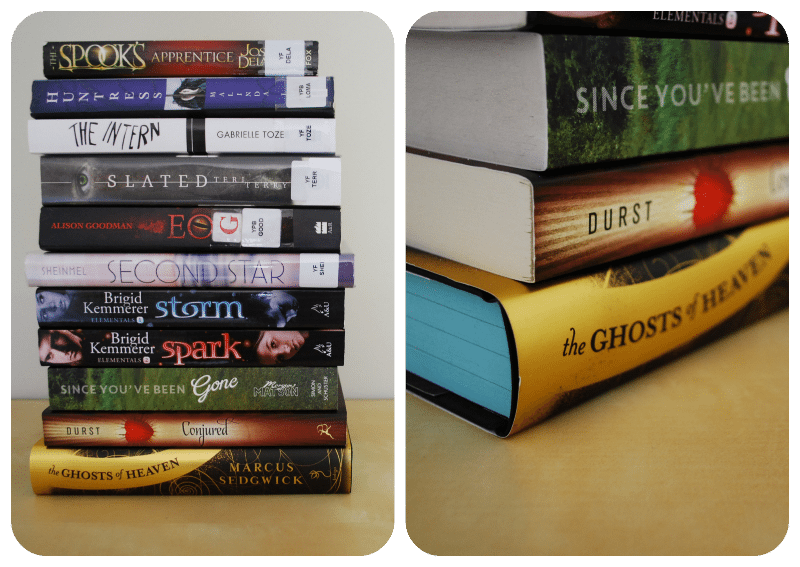 Stacking the Shelves #34 || I accidentally ate the library. I accidentally borrowed a lot of books. It’s not my fault! I promise! It’s not. I dropped Mime off to busk downtown and…the library happens to be downtown. I also happen to be sad and lonely because my two evil overlords (that is to say my 2-year-old niece and 4-year-old nephew) are on holidays. I AM ALONE. What better way to comfort myself than with books? I put books on reserve when my friends say “this is awesome” but then I forget who recommended what. It’s mildly embarrassing. So if I lied about you recommending a book, well, hey it could be worse. SO! I’m particularly excited about Second Star because PETER PAN RETELLING. Sunday – Here are 10 ways to make a writer furious. Monday – I ask if you shouldn’t be in school…which coincidentally is a question Lemony Snicket asks. Thursday – I reviewed Since You’ve Been Gone which as LISTS. PEOPLES, I LOVE LISTS! Saturday – I analysed 10 types of book bloggers (while I’d love to be Sauron, I think I’m The Fangirl). I know. Compared to my usual five-book-diet this is quite shocking. But I have reasons. I HAVE BEEN WRITING. Yes, So I Have Been Writing Vivaciously. I’m planning to do NaNoWriMo (it’ll be my first time. Here’s my profile if you wish to buddy me or snoop at my project. I may squeak with excitement, stand by.) so I thought I’d limber my fingers up in October with a little rewrite of an old sci-fi book. “You can rewrite 70,000-words in 15 days, right, Cait?” I said to myself. All the great ones talk to themselves. Well guess what? I CAN’T. I would need to cover at least 4,000-words every day, and I’m averaging at 2,000-words. So here is the point where we all laugh at Cait The Overachiever. But while we’re talking about it, I’m rewriting Star Rust which is my sci-fi book about space travel, the navy, enemies, and peanut allergies. My books always have this one character who’s obsessed with food. BUT IT’S NOT MY NARRATOR THIS TIME! It’s the best-friend. He’s my favourite. Jessi @ Novel Heartbeat says no one’s opinion is wrong. Kayla @ The Thousand Lives talks about requesting ARCs. Sunny @ A Splash of Ink was so inspired by an idea she wrote it on her bathtub. This is hilarious, by the way. Charlotte @ Books And Baby Etc. made my day by listing Notebook Sisters as one of her favourite blogs! Sky @ Further Up and Further In lists 5 reasons why NaNo is awesome. Robyn @ Spiral-Bound has tips for surviving NaNo. Gina @ Behind The Pages and Emily @ The Loony Teen Writer have a recap on HarperCollins’ #BTCYA author event (which I soooo wanted to go to, but live in the wrong part of Australia). Amanda @ Book Badger is celebrating her blogversary! And she made me blush super hard in her post. You are the best, okay? Solve my problems for me: VOTE! enough ’bout me. how was your week?! i want to hear ALL THE THINGS! what books are you excited to read next?? are you writing anything at the moment? did you accidentally bring home half your library? LET US CHAT!